It gave her health benefits and four weeks of paid vacation along with a salary that supported a good life. Then the rug was pulled from under her in 2009, when the plant closed. Since then, it's been a battle of survival as Delacruz worked a string of part-time jobs. Last summer, she even lost her home to foreclosure. Delacruz, 55, still works part-time. Except at three different places -- Monday through Wednesday she works eight hours a day at a senior citizens center serving meals, and Thursday through Sunday Delacruz divides her time between two other jobs as a cashier at Walmart (WMT) and the Wes-T-Go convenience store. "There's no such thing as a Friday," says Delacruz. "I live paycheck to paycheck." In all, she typically makes $1,600 a month after taxes. It's lesser than what she made at her manufacturing job, where she took home $2,000 a month. Delacruz is one of 2.1 million Americans working multiple part-time jobs, matching the all-time high set in 2014. What's unclear is how many of these workers choose to work multiple part-time jobs or feel forced to by their circumstances. The evidence suggests the latter. Part-time work has become a huge worry for experts who watch the U.S. economy. 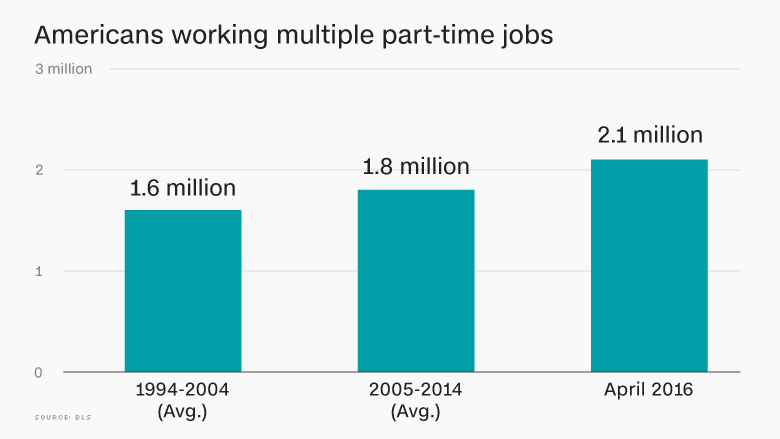 There are 6 million part-time workers who want full-time jobs. It's well above its pre-recession average of about 4 million workers. It's a worry because part-timers have a much higher chance of living in poverty than full-time workers. They're also much more likely to be unemployed, according to a study by Rebecca Glauber, a professor at the University of New Hampshire. "Many workers who are stuck now with multiple part time jobs can't keep up with high tech skills that are in demand," says Bernie Baumohl, chief global economist at the Economic Outlook Group, a research firm. Baumohl adds that employers are implementing new technology -- machines, software -- at a faster pace now than workers can keep up with to maintain skills in demand. That's why there's a job skills gap in America. The part-time problem is bleeding into mainstream America through different channels. Donna Berger is a long-time volunteer at the Quakertown food pantry in Pennsylvania. She's seen a surge in part-time workers showing up for food. "There's an epidemic of part-time workers," says Berger. "They work part-time...but that's not enough to make ends meet." "I went from all of that to nothing, making minimum wage, no vacation, no benefits," says Delacruz. She's slowly worked up to higher wages, earning $10 an hour at Walmart, $8 an hour at the convenience store and $9.60 at the senior center. Because she's worked at Walmart for a year, she's been able to obtain health insurance. She's holding out hope that Walmart (WMT) offers her a full-time position one day. 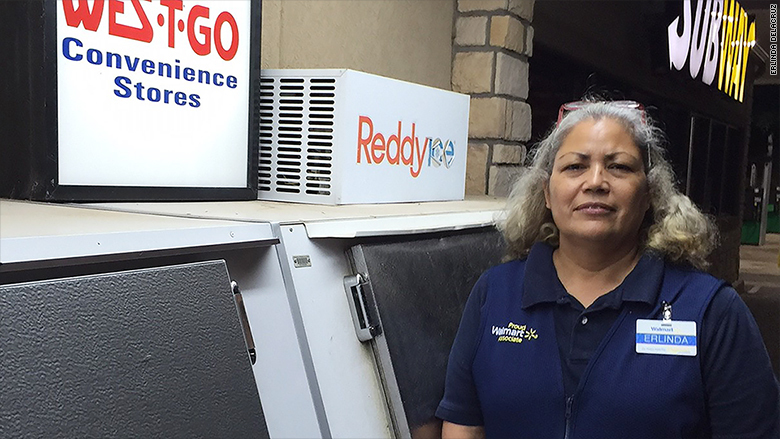 Seven years into part-time work, Delacruz appreciates the few benefits she receives. The seniors' center offered her 24 hours of paid leave a year. She uses the time to go for doctor appointments. Paid time off "is like a luxury nowadays," she says. 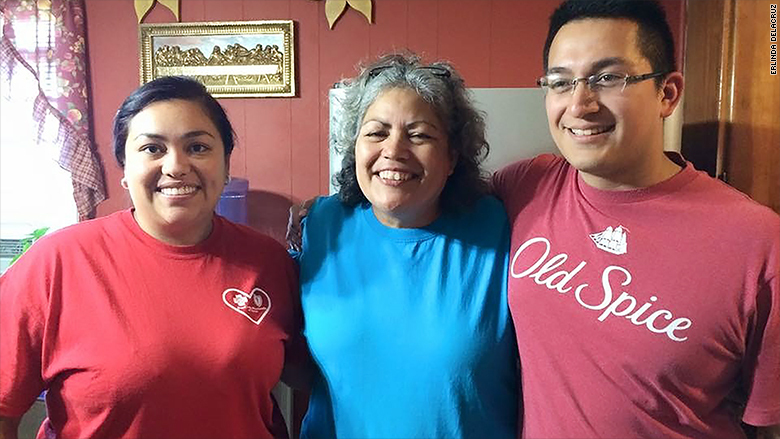 Recently, Delacruz was able to get a loan from a local bank to help pay for a $35,000 house in Winters, a town she has lived her whole life. It's not much but her voice radiates with pride when she speaks about it. She touts the patio, backyard and front porch. But she doesn't expect to spend much time -- or money -- in her new home. Between payments for the house, insurance and gas, she sees little of her paychecks. Her regret is that she doesn't have much time left over to spend with her loved ones including her grandchildren. "There is a drawback on having multiple jobs...I don't have a personal life," Delacruz says. Correction: A previous version of the story incorrectly stated Delacruz's income as before taxes. It is after taxes.